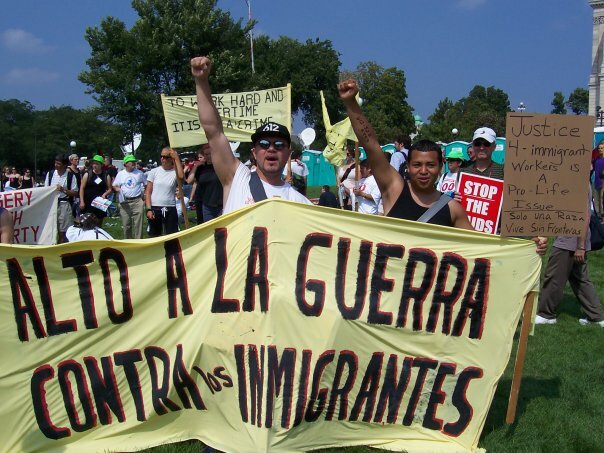 Stop the War Against Immigrants! - Justice 4 Immigrants is a PRO-LIFE issue! I’ve posted below the recent resolution by the Evangelical Covenant Church on immigration and the church’s response. I wonder if any political party has considered these scriptural issues in drafting their party platform? Adopted by the Annual Meeting of The Evangelical Covenant Church, June, 2006. Presented by the Central Conference of the Evangelical Covenant Church. We experience the Triune God as a people along the Way – seeking to follow the will of God. Abraham and Sarah, our forbearers in faith were wandering Arameans, who through faith, became a “great nation” (Deuteronomy 26:5). While we live in a different cultural context today, we still live by God’s kingdom ethic to “love the sojourner as ourselves,” for God’s people were once sojourners in the land of Egypt (Leviticus 19:34; cf. Exodus 23:9). lter or place to rest his head. As faithful Christians, we are to welcome the stranger amongst us, (Matthew 25: 35) and to extend hospitality (Romans 12:13), for we as the church are also a pilgrim people – aliens and exiles in the world (1 Peter 2:11). In so doing, we serve Christ himself. We are called, at all times and in all places to love God with all our heart, soul, and strength as well as love our neighbors as ourselves (Luke 10:27). With the Covenant’s great immigrant tradition, rooted in the historic movement of Swedish pietists, we share the story and journey of modern-day immigrants. We hear God’s call to stand with them, many our own brothers and sisters in our churches, at this time. We cannot remain silent or be still at a time when our own brothers and sisters are scorned or threatened – for, as one member of the body of Christ suffers, we all suffer (1 Corinthians 12:26). n open to all that would receive God’s saving Word. We humbly repent of any action that has not followed this Christian ethic and ask forgiveness. As an assembly of churches in various contexts – rural, urban, and suburban – we will seek to respond in faithful ways that are most appropriate. As local churches we will extend compassion, mercy, and justice to immigrants in need, as we have throughout our history. Furthermore, we will seek to find creative ways to work with immigrant worker centers, citizenship training groups, and other church and parachurch organizations in our own communities. We affirm all who live in peace and for the common good. What are your thoughts? What role should the bible play in influencing our opinions and public policy? Is immigration a “pro-life” issue? Those are some great verses that the covanent church as decided to let influence the way that they see and act with this issues. Way to go. And this is very much a “pro-life” issue. To say other wise makes no sense to me. The one thing that i do hope that we as christians realize is that we are not only called to “keep open the doors or our churches” but we are to keep open the doors of our of all of our lives. The sojourner does need a place to gather for worship, but they also need a place to live, a place to work, a place to be educated, they need clothing, they need health care and as a follower of Jesus those are things that we should be about making sure are open. We can not just keep our houses of prayer open and close off the rest of our lives and think that we are doing the will of God. HECK YES the Church should (and better) play a significant role. Go ahead Covenant Denomination!!! I would not group “immigration” together with “pro-life.” That feels like grouping women’s rights with the rights of people of color. Both are very important, but are separate issues. I guess when I think of PRO-LIFE – I think of issues that address LIFE and DEATH – so I think of war -especially preemptive attacks…. because people die – and immigration (because in the process of immigration and often the reason for migration) life and death are at stake.. I think also of issues of health-care and family support – even education – as life/death issues and finally the death penalty …..
but I do understand your point – it’s a broad perspective rather than a narrowing one….